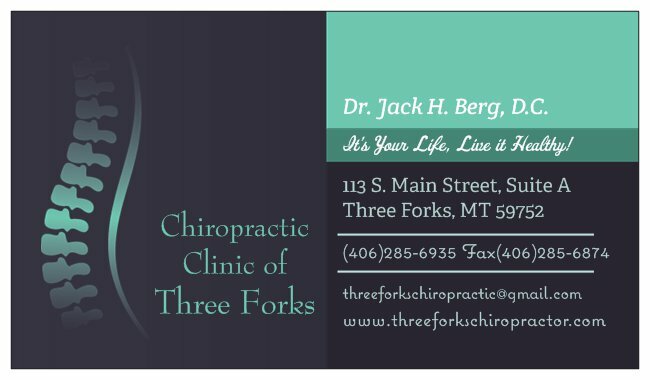 Dr. Jack H. Berg, D.C. at the Chiropractic Clinic of Three Forks offers gentle & effective chiropractic care for the whole family using traditional & instrument adjustments. He also is a provider of Foot Levelers Custom Orthotics, RockTape, & whole-food supplements. Get adjusted! Indigo Healing and Massage offers massage therapy, Reiki, energy work and Raindrop Therapy. It is a place where health and healing are viewed in a holistic way and strives to assist people in their highest healing. Pathways Assisted Living is a comprehensive full service assisted living facility. As our client you are the most important person in the world. You will appreciate our exceptional service. We go above and beyond your expectations. We are committed to excellence and integrity. It is not what we do right one time. It is what we do consistently. Consistently we provide you the best massage for your mind, body & soul. Physical therapy, rehab of surgeries and injuries, accepting all insurances. Three Rivers Medical Clinic is located in the community of Three Forks, Montana and serves a large rural area surrounding the Three Forks area. We specialize in all aspects of health and medical care, taking great pride in our caring and professional service to our patients. If you or your family are looking for up-to-date professional health and medical care with old fashioned, small town service, Three Rivers Medical Clinic can help.